Use this thimble when you need to pass through a combustible wall and into a masonry chimney. The Insul-Flue Insulated Thimble provides security and protection for thru-the-wall stovepipe installations. Protects the wall on both sides when the chimney is not adjacent to the house wall. Reduces the minimum 18" clearance specified by NFPA standard to 2". This unique system can be used with both single wall and double wall connector pipe. Please note: This product is made only to go through walls. Do not use this product to go through ceilings. Back part of thimble is made of cement masonry. This unit is sold in two parts, the thimble cover assembly and the thimble itself. You need one thimble cover assembly per installation. The thimble cover assembly protrudes 13" into the room. The number of thimbles you need depends on the thickness of the combustible wall. The 8" long thimble is designed to pass through a wall of maximum thickness of 7". You can add on an additional 8" by cementing two thimbles together with Rutland stove and gasket cement, so you can pass through walls clear up to 15" thick. Or you can cut the thimble down with a hacksaw for thinner walls. 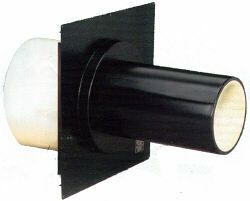 The insul-flue thimble requires 15" or 17" square opening for use with 6" diameter or 8" diameter pipe, respectively. The thimble cover assembly plate is 17"x17" for the 6" thimble, and 19"x19" for the 8" thimble. Complete installation instructions accompany each unit. Installation is easy with simple household tools. Available in 6" and 8" diameters and can accommodate any wall thickness. Reduces the minimum 18" clearance specified by NFPA standard to 2". Attractive and durable powder coat process applied to the wall unit. Please note: You must order a cover assembly and at least one thimble for a complete installation.